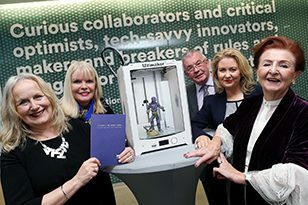 Many thanks to Steve Lenox and all the great team in Irish Network USA for this article promoting their upcoming national conference. We hope you can attend! 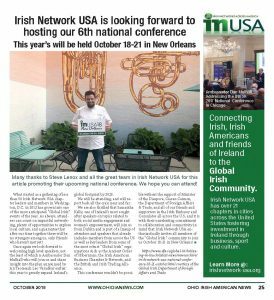 Irish Network USA is looking forward to hosting our 6th national conference, this year to be held October 18-21 in New Orleans. 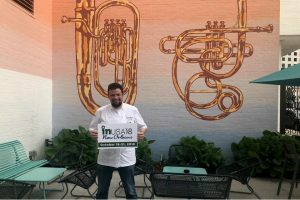 What started as a gathering of less than 50 Irish Network USA chapter leaders and members in Washington, D.C. in 2012 has grown into one of the most anticipated “Global Irish” events of the year. As always, attendees can count on impactful networking, plenty of opportunities to explore local culture, and a guarantee that after our time together there will be no strangers among us, only friends who haven’t met yet! Once again we look forward to welcoming high level speakers, not the least of which is Ambassador Dan Mulhall who will join us and share insight into the plan announced by An Taoiseach Leo Varadkar earlier this year to greatly expand Ireland’s global footprint by 2025. We will be attending, and will report back all the craic near and far.